USAToday - President Obama assailed the Republican presidential candidates last night for not speaking out against the booing of a gay soldier during one of their recent presidential debates. 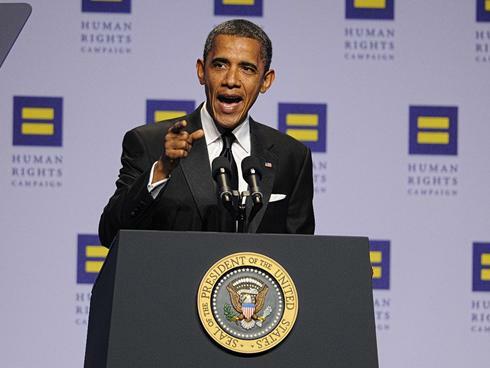 "We don't believe in a small America," Obama told the annual dinner of the Human Rights Campaign. "We don't believe in the kind of smallness that says it's okay for a stage full of political leaders -- one of whom could end up being the President of the United States -- being silent when an American soldier is booed." In his first public comments on the incident, Obama taunted his GOP rivals: "You want to be Commander-in-Chief? You can start by standing up for the men and women who wear the uniform of the United States, even when it's not politically convenient." The comments came about his Republican rivals came as Obama listed a number of accomplishments in the area of gay rights, including repeal of the military's "Don't Ask, Don't Tell" policy against gays. "All around the world, you've got gays and lesbians who are serving, and the only difference is now they can put up a family photo," Obama told the gay rights group. "No one has to live a lie to serve the country they love." Obama also cited hospital visitation rights and his refusal to argue on behalf of the Defense of Marriage Act in court.